Our dog loved them for Christmas! Thanks for selling them when you want something special at Christmas time for your furry pets! I am giving these out to my friends that have dogs for Christmas. The packaging is wonderful and the treats are adorable looking. Even though I'm Jewish and don't celebrate Christmas, I bought this and sent it to the dogs next door. It looks great and the dogs loved the treats. I was sooooo impressed at the amount of cookies in the package for the price! And they were the perfect size treat for our furry child!!! Two of my sons have dogs and so it was nice to find something appropriate and not too expensive. They were packed nicely, had a good presentation and the package was larger than I expected. My dogs just love these cookies and they smell sooo good my granddaughter tries to eat them if you don't watch her; she loves them too. I hope Miles Kimball plans on carrying these treats all year long, because I would buy them all year long. Look just like regular cookies! My mother ordered these for all of the dogs in the family! She then got confused and gave them to her grandchildren for a pre-Christmas treat! They were so good, my 7 year old ate three. Grandma ate two this morning with her coffee. My wife, tried one, thinking it was unusual to shape them like bones, and figured out these were dog biscuits! We are thinging about getting grandma some "MilkBone" dog biscuits for a Christmas treat! The dogs, after we figured that they were for them, loved them! So did the kids! Great treats, low fat and my dog is not allergic to them. She gets one every evening to reward "us" for doing supper dishes. Cute huh? This product is wonderful to give my best friend a reward to show him that I love him. He has never responded to a training goodie this well. I took some to the dog park and now the dogs just love us. They come to greet us even though I just gave them the treats a couple of times. Wonderful Gift for my friends that have furry friends!!!! This purchase was the best I have ever made for Christmas gifts to my friends that have beloved dogs as I have. The packaging is adorable and the treats have that Christmas theme that we all want this time of the year. Would surely recommend this to all - you will not be disappointed. Just hope the dogs enjoy it as much as I have enjoyed giving it. Our dog loved the taste of them and she is a finicky eater. I plan on doing the same thing next year. This year for Christmas, I insisted on giving all the animals gifts. My animals have always loved these cookies, so I decided to by them for all of my family's dogs. I have been told they love them. Our pup is very particular about his treats and he loves these! 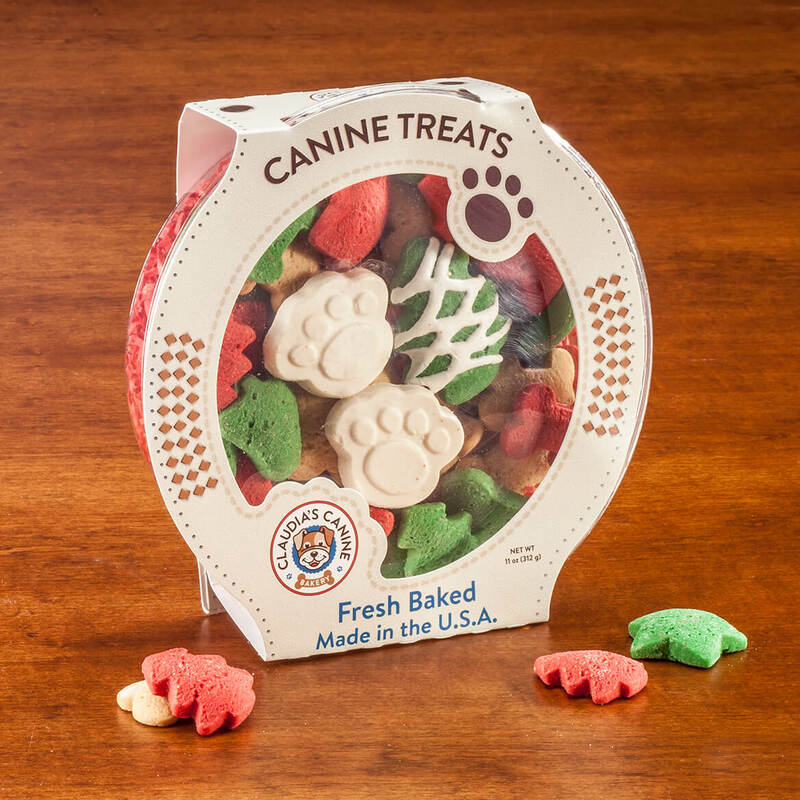 Whether you use these cookies as a reward or a regular treat your dog will love them, too! They are baked like real people food and look delicious. Our pup is our child and we only give him the best. He will actually go to his pantry and show us what he wants and he always wants his Canine Cuisine Cookies! My dogs love these. They were good for treats during the holiday. They smell good enough for people to eat. these are for Christmas gifts for my 2 granddogs who are adorable and will love the treats . only sorry I ordered the a few days before new catalog came and were disconnected 3.00 each. wasn't to happy bout that. Dogs Christmas gift & delicious orange sticks. The Christmas Dog treats were for a friend's dogs. When she opened the box, we were surprised they smelled like good vanilla cookies and of course, the dogs loved them. My dog loves them all except for the white ones. Luckily there were only 2 of the white ones in the box. I still have a few left. every time I pick up the box he gets so excited. I bought two of the Christmas Dog Treats as gifts for my sons, who both have dogs. They were thrilled with them and the dogs, also! Our dog loves a variety of foods nand snacks. Hed really liked these. My dog and my granddogs sre going to love these doggie cookies on Christmas. Would buy again specially on important holidays. We use the cookies for a Christmas Present and distribute them for dessert, a reward, treat or snack. They have a very good aroma, are themed for Christmas and our dog loves them. We have not found anything "not so great" about them, except our dog wants more than one at a time. This is perfect for all your fur babies stockings. The treats are tasty and enjoyed by them. These are a special treat for our Rat Terrier, Rufus. We give him one if we have to leave him at home by himself, like when I have a doctor's appointment, or when we take him to the vet, I take one and give it into him after he is back in the car. I purchased these treats last year for my family and friends dogs..they loves them and wanted more. my dogs loved these! They really smell like sugar cookies. My rescue dogs love these cookies. An Awesome special treat. Got these last year for my dog and she loved them so i had to get more. Enough for a houseful of dog's! I purchased the Christmas cookies to see if our dog liked them. I will be purchasing more for Christmas, to give to family member's dogs for Christmas. Really satisfied. One or two treats after our pet finishes her meal. She looks forward to them. Not sure if I will purchase from you again . The cookies look great as always, however the cardboard covering on the cookies were torn and came off. These were gifts for neighboring pets so not a good presentation. It looked like fun treats for our dogs to enjoy. My dogs love them. Anything that makes them happy I buy. For our 4 year old lab. I have ordered this the last three years for my dogs. They love them and, they make a nice treat. 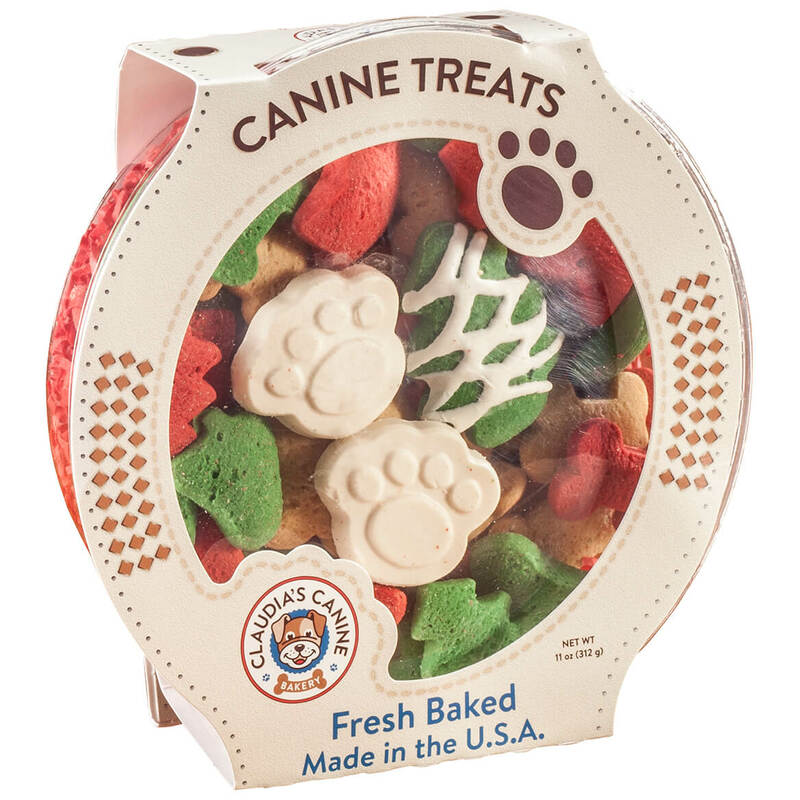 Made in USA fresh baked the best for our furry friends! Grand doggies need Christmas gifts too !! I bought these as holiday treats for my two dogs. They loved them. Our Fur babies need Christmas treats too! Because my dogs loved them. Have three Shih Tzus that are hard to please. They like these cookies. this is for my daughter's dogs as their stocking stuffer. Christmas treats for my "grandpuppies"
For the ruler of my niece's home! My dog lo es treats.. Dogs like presents also and what better way to express our love. I have two dogs and they look very good, I hope they are. My dog gets x-mas present every year. Ordered treats for all family. Have had these before and my dog liked them. Want something different for him again this year. I have ordered this product in the past. My dog loves them. He has his own Christmas stocking that hangs next to ours. If we say cookie, he goes right to his stocking... He loves Christmas cookies! I am buying these for my grandpuppy for Christmas. She is a real sweetheart. Bought last year and we're perfect for our animals! golden retrievers in my home were super duper happy with these treats. what are the ingredients in Canine Cuisine cookies?? •These do not contain chicken. •These do not contain peanuts, but they are manufactured in a facility that uses peanuts in other products. The ingredients are wheat flour, palm oil, corn syrup, honey, vanilla, yogurt, red 40 lake, yellow 5 lake and blue 1 lake. Wheat flour, palm oil, corn syrup ,honey ,vanilla, yogurt, red40lLake, yellow5Lake and blue1Lake. Crude Protein (min) 4%, Crude Fat (min) 11%, Crude Fiber (max) 3% and Moisture(max) 13%. does it have peanut in cookies? BEST ANSWER: Thank you for your question. The Christmas Dog Treats do not contain peanuts. For your convenience we have provided the full ingredients of the product which contains: Extracts of: seaweed, cucumber, lavender, chamomile, fenugreek, calendula, orange flower, rose flower, sage leaf, will bark and yarrow. Also contains purified water, sodium silicate, xanthan gum, magnesium aluminum silicate, caprylyl glycol and sorbic acid. We hope this information will be of help to you. Does this product contain raw hide ? BEST ANSWER: No, it does not. It's strictly cookies for dogs and my dog loved them. Hope this helps. No rawhide. They are soft treats like cookies. No, it is just cookies. How long is the shelf life on the dog treats? BEST ANSWER: Thank you for your question. The shelf life is 3 years, the expiration date will be on the container. We hope this information will be of help to you.